Since time immemorial women have been repressed by men all over the world throughout the centuries. Yet women have risen from their subjugated levels and broken the glass ceiling with sheer grit and determination. From Mother Teresa to Indira Gandhi to Savitribai Phule, these women and many more have shown the exemplary character that helped them achieve their goals against all odds. Women have had to struggle at every turn in the road for their rights. And it is because of those efforts that women today have broken the barriers of gender discrimination in every field and are standing shoulder-to-shoulder with the men. Women have penetrated the more male-dominated fields of politics, astronomy, military, sports, MNCs and aviation. While in the fields of medicine, music, teaching, arts, social services, child and health care women have had an upper hand. While women are stepping out of their homes to make a career for themselves, they also have to fulfill their responsibilities at home as a wife and a mother. Though the modern man contributes to looking after the home and the children, it is still mainly considered a woman’s duty. In view of the current scenario where the army and the airforce has come into focus, here’s shedding some light on the contribution of women in these fields. Punita Arora is the first Indian woman to become Lieutenant General of Indian Armed Forces as well as Vice Admiral of Indian Navy. Padmavathy Bandopadhyay, first woman Air Marshal of Indian Air Force, was awarded the Vashisht Seva Medal for her service during the 1971 Indo-Pak conflict. In February 2016, the then President Pranab Mukherjee, in a radical move, announced that women will be allowed to take up combat roles in all sections of Indian Armed Forces. While this is only the Armed Forces where women have begun their journey, here are a few of the many illustrations where women have left their mark. Anandi Gopal Joshi was the first woman physician in India to obtain a medical degree in the United States. Kalpana Chawla was an astronaut, engineer and the first female of the Indian origin to make her way into space. She flew on Space Shuttle Columbia in 1997 as a mission specialist and robotic arm operater. M. S. Subbulakshmi known as the Queen of Music is only the second woman to receive Bharat Ratna and the first Indian musician to receive Ramon Magsaysay Award. She dedicated her whole life to classical singing showing the world the tradition of India. Lata Mangeshkar is the most awarded Indian singer, a Bharat Ratna recipient and a Legion of Honor recipient. Her singing journey spreads across six decades. She is known for her distinctive vocal range that can extend over three octaves. She represents every generation through the faces for her leading ladies – Nargis to Waheeda Rehman to Madhuri Dixit Nene to Kajol. She even launched her own music label LM Music in 2013. As far as the music industry goes, be it international or Indian, women have always managed to make a name for themselves. Lata Mangeshkar is called the Nightingale of India, such is her melodic voice. Abida Parveen the great Sufi singer from Pakistan began her singing journey when she was merely three years old. 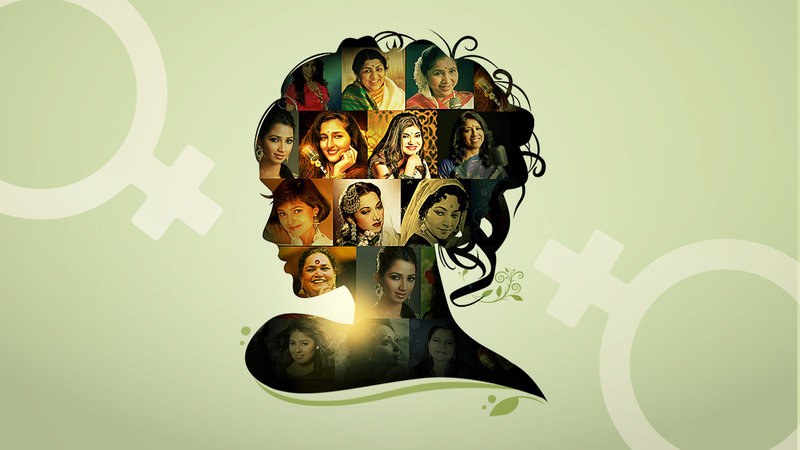 Saregama has brought the works of these women and others together in their product, Carvaan. It is essentially a retro looking music player that has 5000 preloaded songs. Saregama Carvaan comes in different models like Carvaan Gold, Carvaan Premium and Carvaan. On this International Women’s Day, Saregama brings forth the works of women in various fields and hopes for more successful endeavours by women in their field of choice. We Heard You - Saregama Carvaan GO is here for your rescue! Is Raksha Bandhan, Dijiye Yaadon Ka Tohfa..
Is Diwali, Shor ya Sangeet?